Nicole Richie was spotted enjoying herself in Cabo San Lucas, Mexico with friends Christina Aguilera, Simone Harouche, Samantha Ronson and others. I never had Nicole Richie down as a smoker! On a fashion note, I noticed she is wearing her fab House Of Harlow ring from the fall collection which is mentioned in her WhoWhatWear article. 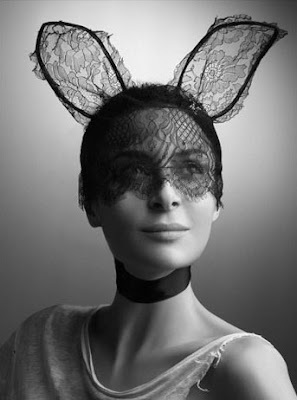 Nicole Richie is wearing a lace rabbit ear headpiece by Maison Michel. According to sources Nicole and friends are in Mexico to celebrate Nicole Richie's Birthday which is tomorrow! I hope they are all having a great time. Img source - popsugar & ontd. It kinda looks like a bachelorette party. Just saying! OMG... you could be right. I agree. it looks like a bachelorette party. especially considering Joel is at home with the kids. why would he not go if it was to celebrate her birthday? Yeah it def looks like a bachelorette party...plus, Joel is not there, and he tweeted he was having a "big night out" saturday night...Bachelor party?! Looks like Charlotte & Samantha Ronson, Masha Gordon, Hedi Gores, Katherine Power, Simone Harouche, Christina A, Sarah Madden, Andy L, Kelly Sawyer and Katie Nehra are all there. It def looks like a bachelorette party to me - maybe she has tried to throw off the press by doing it at the same time as her birthday....so they don't think the wedding is soon. This sounds weird but I always thought she would get married with her long blond hair!